It’s a style older than the US constitution, named after a country that couldn’t be more different than our own, but it’s hard to deny that India Pale Ale is the style of beer most closely associated with the American craft beer movement, and there’s no denying that when it comes to American brewed IPAs hops are the star of the show. Not just any hops either, but hops like Cascade, Centennial, Simcoe, and Citra that are bred and raised in the good ol’ USA. If that wasn’t American enough for you, brewers have turned the hop “volume” up to 11 with double and triple IPAs sporting triple digit IBU levels. Still not convinced that many of the most popular hop varieties are as American as Rock’n’Roll and Hollywood? Consider the fact that local brewers like Land Grant and Zauber use American hops in European styles to put a new world twist on old world classics like Kölsch and Alt bier. There are a lot of commonalities between the craft beer movement and the eat/drink local movement, but unless you live in the Pacific Northwest (Washington, Oregon, Idaho) chances are that the hops in your beer are not locally grown. 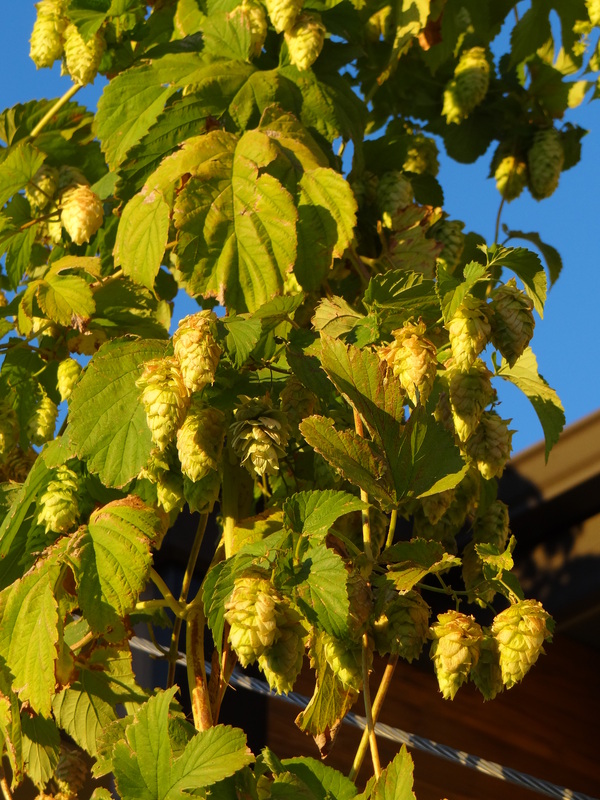 In fact 97% of all US grown hops are produced in the Pacific Northwest, mostly in Washington’s Yakima Valley, but hop growing in the US was not always so highly concentrated. In the late 19th and early 20th centuries the Great Lakes states, including Ohio, were important hop producers. Eventually problems with fungi (downy mildew) and pests (hop aphis) drove production out west where these issues are less problematic. A little thing called Prohibition didn’t help matters. These days rising demand has enticed farmers in other parts of the country to get back in the game. A report by the Hop Growers of America shows a 42% increase in the number of acres planted outside of the Pacific Northwest in 2015. That’s potentially good news for local brewers, who can face challenges in getting a reliable supply of high-quality hops (see my earlier post where local brewers sound off this topic). In today’s post I ask local brewers to share their opinions and experiences with local hops. Tomorrow I follow up with an interview with Brad Bergefurd, who leads efforts on hop research at the Ohio State University extension office in Piketon. As you will see if you read tomorrow’s post hop production is further along in Ohio than most people (including many brewers) realize. Without further delay here are the responses from local brewers to a simple question. What are your thoughts on Ohio grown hops? 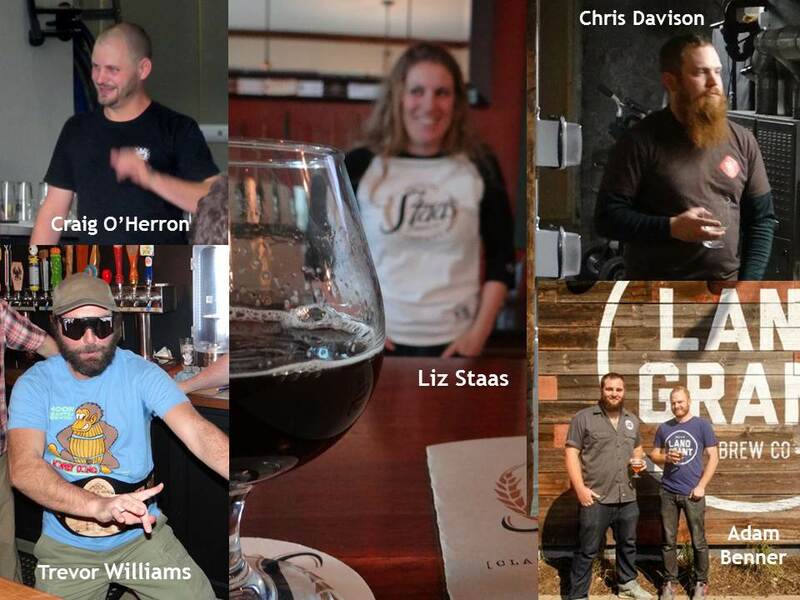 Some of the Central Ohio Brewers who were kind enough to comment for this story. Chris Davison (Wolf’s Ridge) – I like the idea of using them and hopefully will someday. Right now the Ohio hop industry is still in its infancy. There are no pelletizers or growers vacuum packing hops. This is the biggest hurdle – I need hops all year, not just when they’re wet. The second major obstacle is that few growers have proven quality yet. They need to be independently tested for oil content, disease resistance, etc. Part of this, for me at least, is if a variety is “true to type.” A grower might be able to grow German Hallertau or something new and exciting like Cashmere in Ohio, but it’s more likely than not going to perform like a completely different variety. So until tested, I feel like I can’t just assume someone’s Ohio Centennial are what I actually want in my beer. On the positive side, I just received a sample of Cascade from Michigan. The color is great and they smell close to, if not outright, true to type. They were pelletized and vacuum packed. While I haven’t brewed with them to confirm, early signs are reassuring. Ohio is a few years behind this, but I’m confident we’ll be at that stage in a few years or so. The recent OCBA conference in Wooster proved this. At least half the participants were involved in growing Ohio hops. They’re serious about it, just still in the early stages. Craig O’Herron (Sideswipe) – I am all for Ohio grown hops and I have grown very small quantities of hops myself for use in taproom-only beers. I have been in contact with a number of local hop farms in the process of opening and I would prefer to support another local business whenever possible. The big hop companies don’t always help out the little breweries and their customer service leaves much to be desired. Tony Corder (Columbus Brewing Co.) – If the quality is as good and the pricing is comparable, then we’re open to look at them. We’ve brewed a “Fresh Hop” beer annually for the last few years using Ohio grown Nugget from Wisecup Farms in South Salem, OH. The quantity available is limited, so it’s a very small batch. Adam Benner (Land Grant) – I am very interested to see the varieties that come out of Ohio, and excited to see the industry picking up. One of the first things I’d love to experiment with is the flavor profiles of a variety grown in Ohio vs Pacific Northwest. I think this could be a new wave of local flavors, and closest we can get to what the wine world has with terroir. As a Tettenang grown in Germany has a different profile than a US Tettenang, I would imagine that with the different soil compositions in Ohio we will get region specific hop profiles. Liz Staas (Staas Brewing) – I think Ohio grown hops would be great. Cascade hops and Centennial hops are two varieties of hops that I personally love, and both of those varieties grow very well in Ohio. Many different people have approached Donald and I over the past couple of years with the intent of starting hop farms. 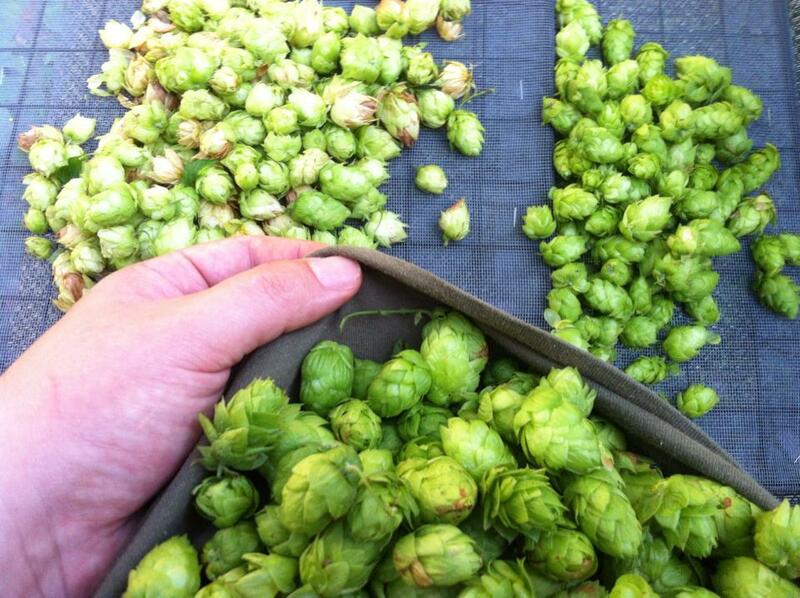 It is my belief that we will be using more and more locally grown hops in the years to come. Locally grown hops would allow for increased freshness which could drastically improve the quality of our American-style beers especially. Hops are a rather fragile ingredient. This is exemplified in just how quickly an IPA can lose its aroma. This is why IPAs are so much better when consumed fresh, the aroma deteriorates by the day. Trevor Williams (Hoof Hearted) – We have only brewed with Ohio grown hops once and it turned out great. We used Chinook & Nugget grown by Portage Valley Hops in a batch of Musk of the Minotaur IPA. Cameron Lloyd (Zauber) – Farmers need to start growing them before I can make a judgment call. It would be really nice to source locally. I like the idea in theory, but need to see it in practice. My priority for hops is to have a reliable, high quality, consistent raw material. If Ohio hops can provide that, and maybe provide some interesting and exciting flavors at the same time, I’m all for it. I need to see the proof first and be able to test new crops on a pilot scale to be sure they’re up to our standards. Then, there would need to be a regular enough supply to make it beneficial. I suspect we will need to see a couple pioneering farmers provide a proof of the quality that can be grown here first, and that could then lead to a critical mass of farmers getting on board to form a CoOp that would make it commercially feasible to harvest, separate, dry, and pelletize hops for production use. Fred Lee (Actual) – I’m a big proponent of Ohio grown hops. Cascade hops grow as well if not better in Ohio than anywhere else. We’ve brewed fresh hop beers using whole flower hops in the past and will continue to do so. The biggest limitation is the short window of time after harvest when the hops are still fresh and suitable for brewing. Hi Pat, my name is Mike Cisneros and I produce a craft beer podcast called CincyBrewcast, focusing on the Cincinnati craft beer industry. I’m preparing to interview David Volkmann of Ohio Valley Hops next week ahead of the OHGG Open House on July 25th. I read your articles with great interest and they have been very helpful in my preparation. Also, with amazing irony, I tell you that I work for WLWT, am actually very good friends with Jennifer Schack (the reporter who did the story on the Milford, OH hop farm) so I will definitely discuss that interview with her. I had not seen the report–I was off work the last 3 days and did not catch our newscast. Anyway, you can visit http://www.cincybrewcast.com to find out more about our program. We will be interviewing David on July 7 and including the full-length interview with him on our July 13/14 posting which is available on iTunes, Soundcloud (search Cincybrewcast) or in the RSS feed of our www. Anything else you can give me a “heads-up” on ahead of my talk with David would be greatly appreciated. Nice to hear that you liked the hop series. I’ll definitely be looking forward to your interview with David Volkmann. I’d be interested to hear how difficult it is to obtain rhizomes of the more popular aroma hops. I also wonder how many people and how long it takes to harvest an acre of hops. I can think of many more but I’ll just wait for the interview. thanks Pat, two great questions I’ll be sure to ask.